Carmen to be at tables by Half-past five in the Morning. (This rule applies to those who are in the yard by Seven o'clock at night). That before Cleaning Horses beds are to be put up, and Stables properly cleaned out. Carman that have been on long journeys are to be at Stables by Half-past eight in the Morning. (Short journeys as Rule 1). No Smoking allowed in or near the Stables. Anyone breaking the above Rules will be fined sixpence, and same will be deducted from their pay. ON SUNDAYS: Carmen are to be at Stables to attend to horses by Seven o'clock in the Morning and Four o'clock in the Afternoon. Anyone not turning up on Sundays will be Fined One Shilling and same will be given to those who did attend. On no account may a Carman use a whip to any Horse in the Stables, and if found doing so he will be discharged immediately. The horsekeeper will be responsible to see these Rules carried out, and also, upon orders, he may relax these Rules as circumstances may require. 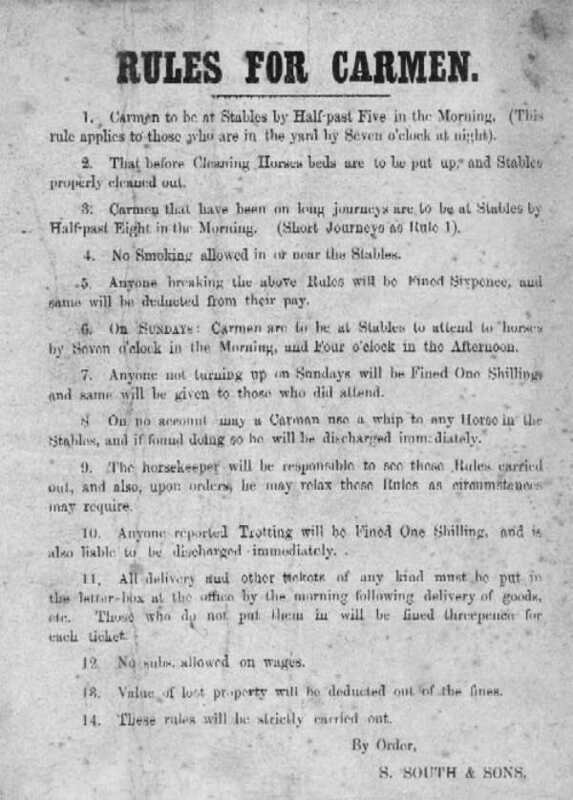 Anyone reported Trotting will be fined one shilling, and is also liable to be discharged immediately. All delivery and other tickets of any kind must be put in the letter-box at the office by the morning following delivery of goods, etc. Those who do not put them in will be fined threepence for each ticket. No subs. allowed on wages. Value of lost property will be deducted out of the fines. These rules will be strictly carried out.